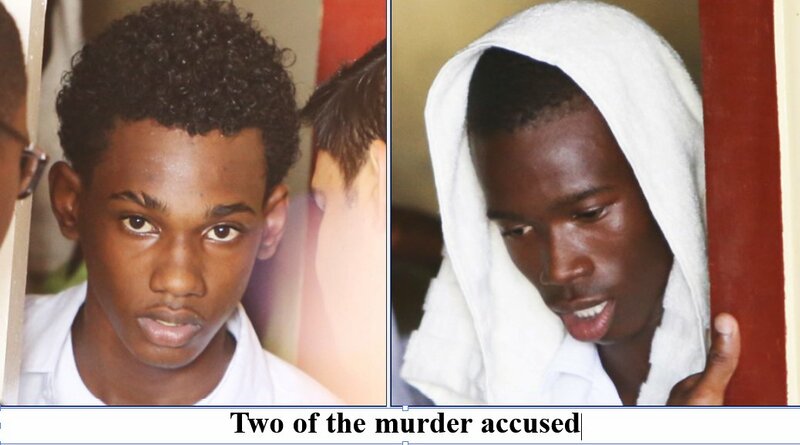 The five teens accused of killing retired Professor Pariedeau ‘Perry’ Mars during a robbery were yesterday arraigned for his murder in a city court, amidst a heightened police presence to ensure order. 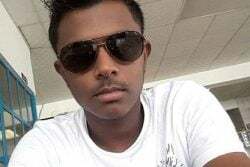 The five suspects, whose ages range from 15 to 18 years, were read the charge during a hearing that was held in-camera (outside of the view of members of the public and press) by Chief Magistrate Ann McLennan due to the age of the youngest accused. Nikita Dover, 17; Carl Chase, 16; Andre Benjamin, 16 and Orin Anthony McRae are facing murder charges. The fifth defendant who is 15 cannot be named for legal reasons. Family members of the suspects as well as curious onlookers and members of the media earlier flocked the city courts complex to get a glimpse of the accused, who are alleged to have murdered Mars in the furtherance of a robbery. Police officers were called to control the crowd and ensure order while the teens were at the court. 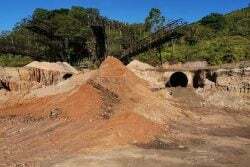 A sixth suspect, who was arrested after it was suspected that he collected the stolen items, was released as there was insufficient evidence to link him to the crime. This was after one of the accused reportedly admitted leaving stolen items at the sixth suspect’s house after the crime was committed. Police have said that Mars, 75, was found in his Prashad Nagar home around 6.30pm last Thursday with his hands and feet duct taped and injuries to his head. The house was ransacked and a number of articles and cash were missing. The female accused, who is 17 years old, was known to have frequented Mars’s residence and she allegedly visited him and let the others into the house. 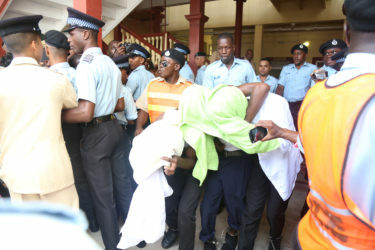 The well-covered murder accused leaving the court yesterday amid a police cordon. This newspaper was told that the female suspect informed her boyfriend, who was also charged yesterday, that she was going to Mars’s house and that he would be at home alone. The boyfriend allegedly told her that it was a good opportunity to rob Mars and he contacted his friends and they met at a house in ‘C’ Field, Sophia where they reportedly hatched the plan, before walking over to Mars’s house. Among the items recovered by the police are a sum of cash, a laptop computer, an iPhone and a video game console, the police had said in a statement. Mars was subsequently found by his wife on her return home from Linden. He was rushed to St Joseph Mercy Hospital, where he died while receiving medical attention. Prior to the hearing yesterday, media workers were forced off the stairways leading to the court by officers. Officers told them they were not allowed to be on the stairway and threats were made to have all media persons placed outside of the court compound. One particular reporter was also detained by officers after he was told in a rather hostile manner to remove from the stairs. “That’s not the way to speak to people,” he replied and as a result an argument ensued between him and the officer and he was subsequently detained. ‘A’ Division Commander Clifton Hicken was called in as the tensions grew between with the police and the media. He told all media personnel standing in the area to keep the stairway along with the walkway clear. When questioned about how video footage and pictures would be taken if the officers were preventing them from doing so, the commander gave no response but maintained that the stairway and walkway were to remain cleared. As the teens headed into the police vehicle, their faces were covered as they were escorted out. Scores of police officers also lined the walk way so as to prevent persons from getting within reach of the defendants. Family members of the young defendants began to shout and wail, while others shouted “Murder!” and for them to show their faces. The matter is set to be called again on June 14.